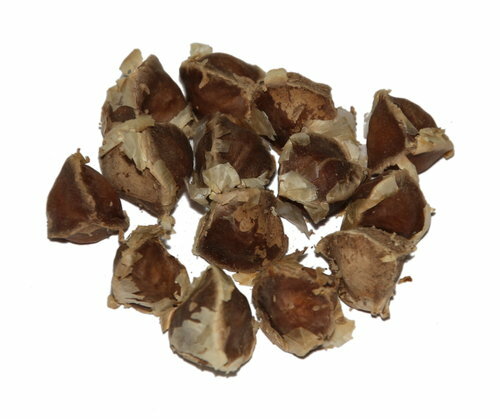 You get moringa seeds from the pods of moringa tree or drumstick tree. They are very tender when they are freshly taken, but once you dry these seeds, they become hard and look like small beans. They are grayish white in color and have lots of health benefits. You can make natural moisturizer by extracting the oil of the moringa seeds. This oil provides nourishment to your skin and keeps the skin healthy and glowing. Moringa seeds are rich in Vitamin A, which is very effective for a healthy skin. Being an antioxidant, it reverses the actions of the harmful free radicals that form in the body and protects the cells of the skin from getting damaged. It is also needed for increasing the formation of collagen, which keeps your skin firm and young looking. Various signs of premature ageing of the skin like appearance of wrinkles, fine lines and sagginess of the skin are prevented by consuming moringa seeds regularly. Many of the skin care products make use of the benefits of moringa seeds. The oil extracted from these seeds is an important ingredient in many of the beauty products and they keep your skin free from pimples, blackheads, acne, black spots and many other skin problems. As a result your skin becomes more bright and clear with a natural glow. Vitamin A and zinc that are contained in these seeds also help in healthy hair growth. Vitamin A is good for the scalp and maintains the health of the hair. Zinc strengthens the immune system and helps in keeping the sebaceous glands unclogged. The antioxidant properties of moringa seeds keep the internal system of the body healthy, which in turn benefits the hair too. Vitamin C in these seeds help in increasing the blood circulation in the scalp and thus provides more nutrients to the hair follicles, leading to the growth of strong and healthy hair. Moringa seeds are rich in antioxidants and therefore very beneficial for your health as they act against the harmful actions of the free radicals in the body. These seeds are rich sources of Vitamin A, C and B complex and many other antioxidants and keep you in good health. Moringa seeds have anti-carcinogenic properties and therefore they are very effective for preventing cancer. They destroy the cells causing cancer and thus prevent the growth and development of cancer cells in the body. Researchers say that if you take moringa seeds daily for 3 weeks, you get relief from colon cancer. Zinc is found in good amounts in moringa seeds and this is necessary for the secretion of the hormone insulin. By maintaining the normal secretion of insulin, it helps in keeping the levels of sugar in the blood normal. So, if you are suffering from diabetics, have the extract of moringa seeds and your sugar level will be normal. Vitamin C is present in high quantities in moringa seeds and this act as an antioxidant protecting the body from various infections and making the immune system strong. It curbs the harmful actions of the free radicals and prevents various diseases. Moringa seeds are rich in Vitamin A and so it is good for keeping your immune system strong. It protects you from various infections and diseases. They are also good for repairing the mucous membrane. Vitamin A is also good for healthy eyes and provides you good eyesight. Moringa seeds are therefore good for preventing diseases of the eyes as well. Oleic acid is a monosaturated acid that is very essential for a healthy body. Moringa seeds are rich in this fatty acid. As a result, it is an excellent substitute for the animal fats that are full of highly saturated fats that are harmful for the body. Oleic acid helps in increasing the amount of good cholesterol in the body and lowers the levels of bad cholesterol, thus keeping the heart healthy. It can help in preventing the formation of blood clots that may lead to severe cardiovascular problems. According to the researches made by scientists, these seeds are very effective in lowering the amount of oxidized lipids in the body and are very useful for maintaining the cardiac health. They help in preventing the damages done to the heart tissues. In addition to vitamins, moringa seeds are also rich in many minerals that are useful for the body like calcium, zinc, copper, iron, magnesium and so on. All these minerals are useful for the body in one way or the other. Calcium is essential to keep your bones and teeth healthy, while iron is important for increasing the number of red blood corpuscles in the body and to prevent anemia. Zinc is needed for the production of sperms and it is also good for having healthy hair. Magnesium is good for bones and teeth, as well as for the health of the heart and for diabetic patients. Copper is needed for the proper absorption of iron in the body. It is also good for treating arthritis and for the proper stimulation of the brain if taken in appropriate quantities. Proteins are one of the essential nutrients needed by the body for many of its functions. It keeps your body healthy and energetic and provides you stamina for carrying out various activities. Athletes require protein rich food to stay in good form. Moringa seeds have high content of protein. So you can include these seeds in the powdered form in your daily diet to get enough protein that you require per day. The anti-inflammatory properties of moringa seeds are also well known. Because of this property, it is very effective in reducing soreness, inflammation etc. It is also effective for treating arthritis and gets you relief from joint pains.